2017 was a big year for healthcare and patient satisfaction was an important topic of discussion. 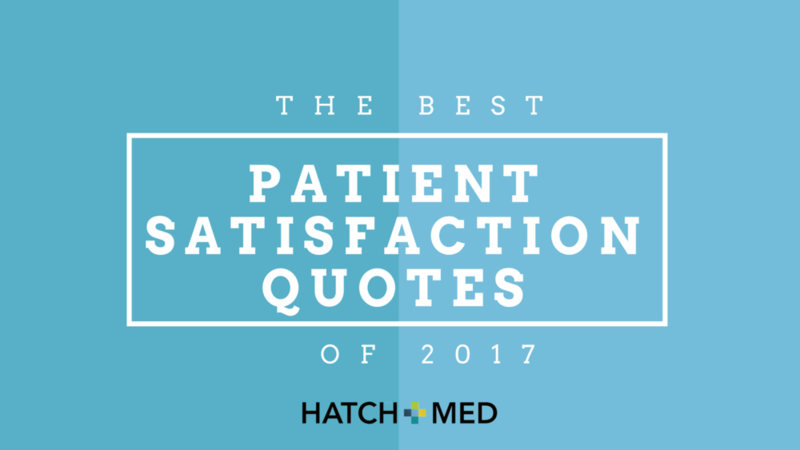 Here, in no particular order, are ten of the best patient satisfaction quotes of 2017. “A great patient experience connects clinical excellence with outcomes. It connects efficiency, quality, behaviors and mission with caregiver experience and engagement. The patient experience relies on teamwork, communication, shared decision making, empathy, compassion and human connection. It is also influenced by dignity, respect and humanistic values, as well as the ability and willingness of clinicians to relate to their patients as people, not as a medical condition or a room number.” wrote Christy Dempsey on her experience as a nurse of over 30-years, a breast cancer survivor, and family member of a critically injured police officer. "Patient experience is at the heart of healthcare," said Jason Wolf, president of the Beryl Institute and founder and president of the Patient Experience Institute. "This idea of consumerism makes technology important, but technology for the sake of technology is the demise of it," he said. "When it's purposeful, it becomes a wellness tool, a mean by which we can reduce readmission and give people greater ownership over their care." “The way that we approach improvement for patient experience measures is to reframe it. The exercise is not to make consumers happy. The exercise is to reduce patient suffering” says Deirdre Mylod, PhD, Executive Director of the Institute for Innovation and Senior Vice President of Research and Analytics at Press Ganey. "Analyzing extensive patient satisfaction data has helped organizations to hone their accuracy in predicting HCAHPS scores, sometimes to within a decimal," says Ryan Sawyer, president of operations management software firm Hydracor. "But that doesn't necessarily equip [hospital leaders] with the information they need to raise HCAHPS scores." For this reason, ­­­Sawyer recommends rounding hospital leaders strike a balance between collecting patient feedback and personally connecting with patients to positively affect an organization's HCAHPS metrics. He believes very interaction with the patient should drive value for that patient. "The reason why those patients are not returning to the hospital is because they actually have better communication with their care team and because of that communication they have a better understanding of how to take care of themselves, and overall it is a much more fulfilling experience for them," said Dr. Jocelyn Carter, lead author of the study and an internal medicine physician at Massachusetts General Hospital. Overall, these are just a few great patient satisfaction quotes of 2017. We look forward to seeing what the new year brings!